You can learn a lot from your kids. Britton, our youngest child, brought home a sign from church a couple of months ago. The message was simple and plain…”You shall not make for yourself an idol.” At the bottom of the sign was a man who is bowing down- obviously paying homage to an object of earthly affection. 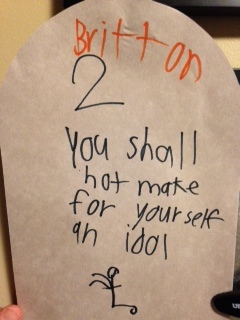 Britton’s lesson that day was about ancient people from the Bible who worshiped all sorts of gods. Fertility gods. Storm and harvest gods. Sea gods and hunting gods. Even the Israelites who were being led by Moses out of Egypt quickly deserted their teachings and faith to worship a “golden calf” (Exodus 32). They were tired of waiting on Moses to return from Mt. Sinai and decided to create a new object of worship. Needless to say, God wasn’t very happy with these impatient followers. I’m not much better. While I don’t practice the worship of pagan gods discussed in the Old and New Testament, I’m just as guilty about being impatient and getting distracted. Many things can serve as idols for me. If we aren’t careful, we can become quite caught up in chasing earthly pleasures instead of focusing on true worship. We serve an all-powerful God. The creator and ruler of the entire universe. We have been given implicit instructions to keep focused. I explained to Britton that anything that hinders our pursuit of seeking God’s will and instruction for our lives is considered an idol. It can be Legos (as Britton brought up), college football season, the pursuit of that promotion at work or concern about a family relationship. What clouds your focus? What idols stand in your way of serving the living God? I easily recognize a few in own life- and I pray for self-awareness (and guidance from friends) to help me with those that I cannot clearly see. Let’s all pray for help to remove the idols in our lives.